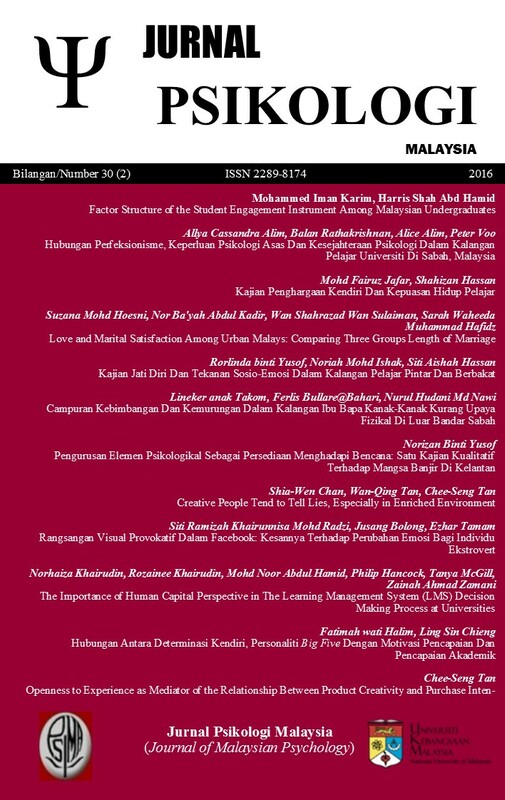 The Malaysian Journal of Psychology (JPM) is a peer-reviewed journal that covers various fields of psychology with emphasis on Malaysia and neighbouring region. It covers areas such as cognition, social psychology, developmental psychology, counselling, education, and industrial and organizational psychology. JPM is co-owned by Universiti Kebangsaan Malaysia and Malaysian Psychological Association (PSIMA). It publishes original works based on standards of excellence and expert reviews. We encourage submissions from researchers, academics, practitioners, and students in all of the various subfields of Psychology. We aim to provide a forum for debate and critical analysis of psychological, societal, and developmental issues. The journal is issued three times a year, in May, August and December. Manuscripts are published in both Malay or English. Jurnal Psikologi Malaysia is currently accepting submissions for its upcoming issues to be published in 2019. We are currently publishing three times a year.